Price Lake is a man made lake. The dam that created the lake is located under the bridge beside where I painted. I stood next to the rail with the water flowing beneath me. The lake was created on 4,200 acres gifted to the State by Julian Price upon his death to be used as a public recreation area. I’ve been asked to share the size of my paintings in my posts as well as the medium. I’ve updated that information in the Gallery. 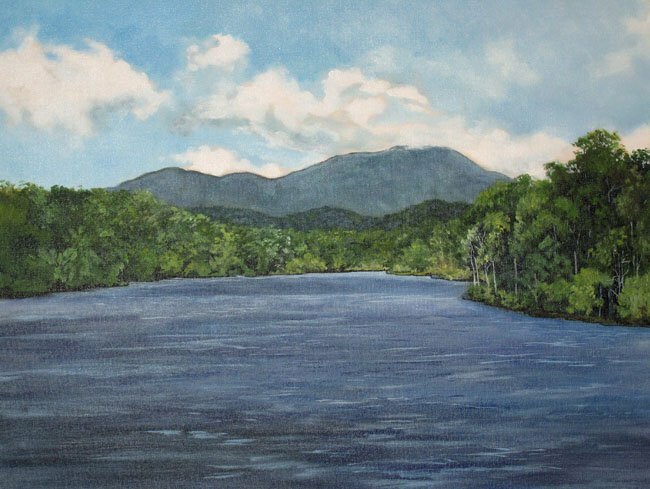 He also asked why I was painting a plein aire painting on an 18″ X 24″ canvas, stating that it was to large to accomplish at one sitting. My assumption is that many artists paint on small canvases when plein aire painting because of several reasons. They paint on small canvases because it’s easier to transport their gear to and from the painting site. They could paint smaller paintings to accomplish it in a shorter time allowing more time for additional detail or to capture the ever changing light better. I paint most of the time where I can drive up and park my truck. I usually set up within 50 yards. I don’t have to worry about the weight of gear, the size of the canvas or how to protect it from unexpected weather changes so close to my truck. Also I’m a quick painter, as an instructor at Paint Along Studios I learned to paint quickly by painting over six hundred times, each time completing a 16″ X 20″ canvas while assisting students in three hours or less. A larger canvas simply requires a larger brush and larger brush strokes. In many ways I find that I enjoy the larger sizes because I don’t have to control a smaller detail brush while trying to stay loose.